Roland has done a pretty good job of designing its own digital pianos down the years, but in 2015, it set others the challenge of coming up with a blueprint for the future by way of the Roland Digital Piano Design Awards. Collaborating with "the planet's most forward-thinking designers and artists," the company sought to find "a digital piano concept that breaks with tradition and creates a new style and sensibility for the instrument." The winning designs can now be viewed on the Roland Digital Piano Design Awards website, and are as outlandish as you might expect them to be. 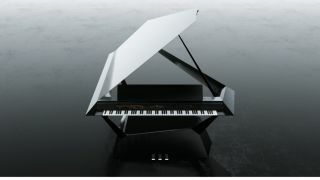 The grand prize was awarded to the Facet Grand Piano (pictured above), which houses all of its speakers within the base sound chamber and comes with a built-in touchscreen. We're not totally convinced that we'll soon be seeing this particular design on stages and in studios, but it's certainly different.